Master Splinter is still attempting to meditate in the woods of Northampton, Massachusetts but his efforts once again prove futile. April and Robyn get back from shopping, and April is not happy with her new “California” look and lifestyle. April again complains about the messy apartment, and Robyn tells her sister that she’s not her mother and to stow it. Casey wakes up in Gabby’s bed to find her missing. Jones gets up to find her and discovers that she’s been throwing up in the bathroom. Gabby then tells Casey that she’s pregnant, with someone else’s baby. “I… don’t know what to say…” replies Casey. “Gabe, don’t cry… I’m not gonna leave you.” Jones states as he hugs her. “Don’t stay just because you feel sorry for me…” Gabrielle sniffs. We see the old man sitting up in bed on his own, having eaten a meal of fast food. Splinter is walking in the forest, troubled over his inability to concentrate. Eventually the Sensei arrives at an old abandoned factory. 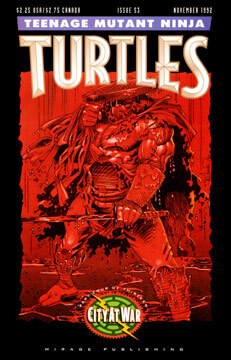 The Turtles are fighting the Foot and their robots when Shredder’s Elite joins the fray. Inexplicably, the Elite helps the Turtles. As the battle wages, Leonardo eventually faces of with the Elite, who evades the Turtle, slays two more Foot Soldiers, and then drops a smoke bomb and disappears. The police arrive as the violence escalates and innocent people are killed, but the smoke allows the Turtles to get away. The guys make it back to the sewers and reflect on what just happened. Leo worries that whatever’s going on with the Foot might be too dangerous for them to be involved with. “We shouldn’t even have been there…” muses Leo. “What? Leo, what are you saying?” Raph interjects. “Leo, you can’t know that…” interrupts Don. Back in Tokyo, Japan, the business woman is watching a video of the recent Turtle/Foot skirmish. “The situation is at crisis level. We should act… immediately.” her assistant states.